Nearly 80% of children between the ages of 0 and 5 use the Internet on at least a weekly basis in the United States, according to a report released Monday from education non-profit organizations Joan Ganz Cooney Center and Sesame Workshop. The report, which was assembled using data from seven recent studies, indicates that young children are increasingly consuming all types of digital media, in many cases consuming more than one type at once. Television use dwarfs internet use in both the number of children who surf the web and the amount of time they spend on it. The analysis found that during the week, most children spend at least three hours a day watching television, and that television use among preschoolers is the highest it has been in the past eight years. Of the time that children spend on all types of media, television accounts for a whopping 47%. Heavy television viewing may even be partially responsible for the rising number of children who use the Internet. 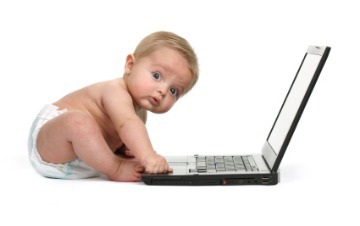 Parents in one study indicated that more than 60% of children under age three watch video online. That percentage decreases as children get older (the report suggests this is because school-age children have less time at home), but even 8- to 18-year-old children reported in another study that they consume about 20% of their video content online, on cellphones, or on other portable devices like iPods. Internet and television use among children has become entwined in other ways as well. A 2010 Nielsen study suggests that 36% of children between the ages of 2 and 11 use both mediums simultaneously. Altogether, children between the ages of 8 and 10 spend about 5.5 hours each day using media ??? eight hours if you count the additional media consumed while multitasking. The report doesn?? ?t attempt to solve the more-than-decade-old debate of whether all of this screen time is good for children. Instead, it preaches balance: ?? ?My mother used to say that too much of anything isn?? ?t good for you, whether it be eating only protein, shooting hoops all day or ?? ?always being connected??? to the digital world,??? said Dr. Lewis Bernstein, executive president at Sesame Workshop, in a press release. It does, however, point out that time spent in front of books remains constant even as screen time increases. 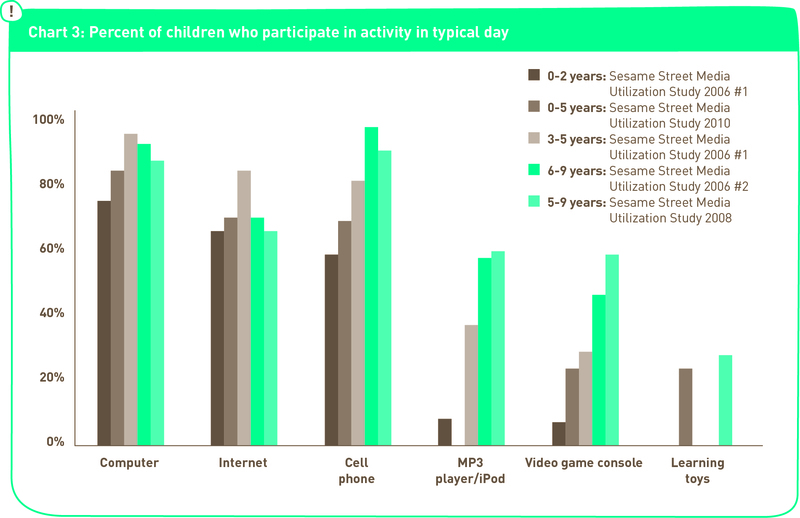 About 90% of 5- to 9-year-olds who participated in a 2008 Sesame Workshop study reported spending at least an hour every day reading old-fashioned, physical texts. Not only the data about child internet use is impressive, TV has a stronger hold on them that before. Will it last as they grow up or just drive them to more video consumption online? @mazux, what would they have be doing originally, playing with lead painted toys? Biting the spines of poorly written children’s books? I grew up on video games, I used to have this one called spy fox versus the dry cereal. Man was that a fun game. You should search for some gameplay videos on youtube to see how awesome it is, if you can figure out how.